New Delhi (VNA) – A delegation of the Centre for Indian Studies (CIS) under the Ho Chi Minh National Academy of Politics (HCMA) is on a visit to India from August 6-18 to explore how soft power is used in the country. On August 9, the delegation visited India’s Observer Research Foundation (ORF) and engaged in a seminar on the India-Vietnam relations, under which the Indian side shared experience in promoting its soft power. The seminar was co-chaired by Assoc. Prof. Dr. Le Van Toan, CIS Director and Chairman of the HCMA’s Science Council, and Prof. Harsh V.Pant , Director of the ORF’s Strategic Studies Programme. 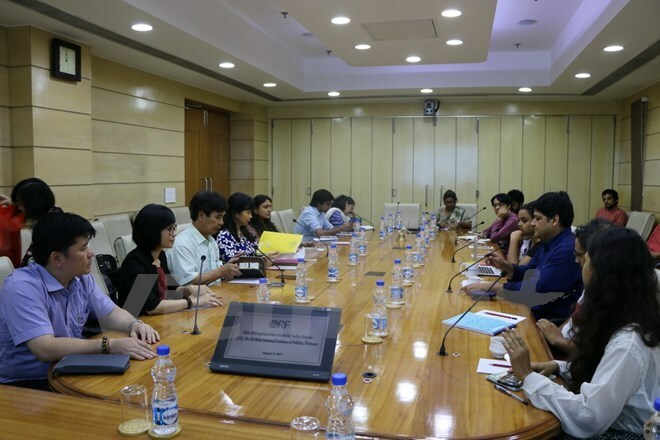 Later the same day, the delegation visited the Centre for East Asia Studies (CEAS) under the School of International Studies of the Jawaharlal Nehru University (JNU). Toan, who led the delegation, and CEAS Director Prof. Dr. Srikanth Kondapalli discussed the possibility to enhance the two sides’ cooperation in research and training in the field of soft power promotion. They also talked about ways to enhance connectivity between scholars as well as learning exchange between Vietnam and India in general and the two centres in particular. On this occasion, Toan co-chaired a seminar with professors, lecturers, researchers and students of JNU. Apart from Delhi, the delegation is scheduled to make fact-finding trips to agencies and research institutes in several other states of India, and visit the India-Vietnam Solidarity Committee in West Bengal state.